Spa by JW is Bengaluru’s health and wellness destination, designed to restore a natural state of equilibrium. 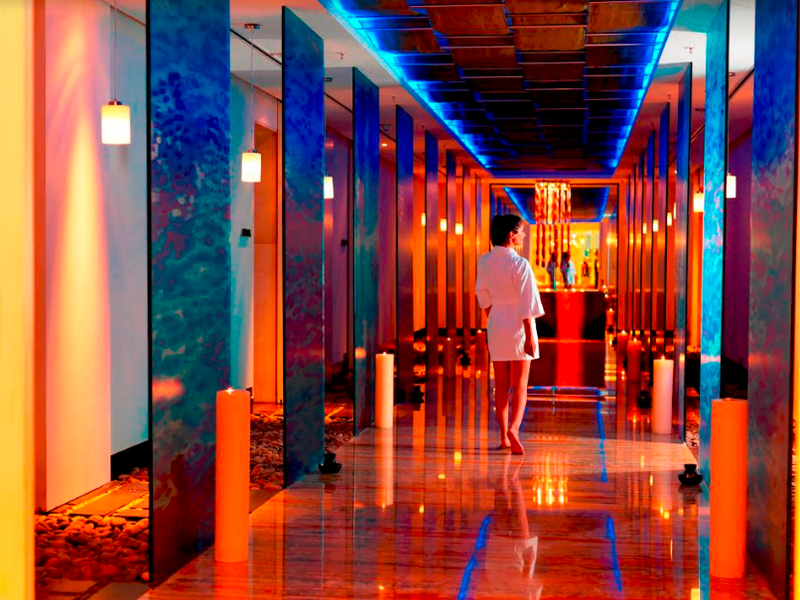 The six treatment rooms, sauna, steam, whirlpool and a state of the art fitness centre set the scene at the Spa by JW. Coupled with the plush décor and serene ambience, the spa is designed to give you a holistic healing experience. There are a host of spa treatments inspired by Indian, Western and Asian therapies. 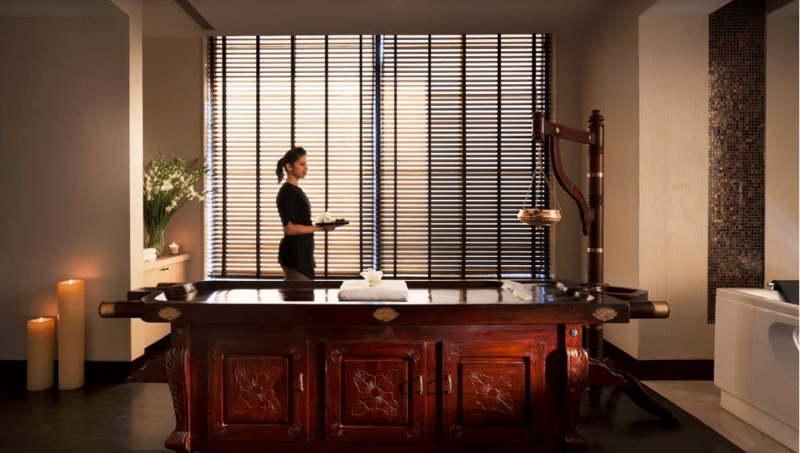 In an effort to bring the Spa Rituals from across the globe to Bengaluru, Spa by JW has introduced two exquisite therapies – Indocéane Spa Ritual and Polynesian Spa Journey to its already impressive repertoire of therapies. I was suggested the latter and told that I would have 2 hours of blissful relaxation! Located on the wellness floor alongside the pool and the gym, the spa is an oasis of calm. I am led to a quiet room to fill in the consultation form that asks me if the therapist must be aware of any medical condition. As I am filling the form, a cold towel and cold tea (a delicious concoction of lemon, ginger, mint and honey) is served. My therapist Jyotika is ready and ushers me into a large room that has separate sections for treatment, hydrobath and a changing area complete with a number lock cupboard! Spa by JW endeavours to offer guests the very best in spa rituals designed to sooth your body, mind and soul in the very heart of the city and it is easy to see why when you are hear. The music is soft never overpowering and the room temperature is perfect. After changing, I am given a foot cleansing with a scrub and then I head to the warm spa bed, where I am asked to lie down face up. I am explained that this is an exotic spa ritual inspired by four of the most beautiful islands hidden in the heart of the Pacific Ocean. My therapist starts with an ‘Exotic Island’ inspired Body Scrub. The scrub is vanilla-scented and blended with pure white sand from Bora Bora, sea salt, coconut shell and algo-monoi that exfoliates the body leaving it soft and supple. After this I am asked to head to a hydro bath where the azure bath inspired by the crystal blue waters of the ‘Manihi Lagoon’ to protect and hydrate the skin. After drying myself I head back to the spa bed which now has two hot water pillows to accentuate the ocean experience and I am given a Mahana Massage that incorporates a rhythmic Lomi-Lomi massage and warm sand pouches to loosen muscles and nourish the skin. The exotic journey concludes with the Polynesian oil originated from Raiatea, the sacred island being swept over the skin with its subtle golden pearls leaves a radiant finish on the skin. As the oil is light and has a fruity flowery fragrance, you do not need to shower post the treatment. I felt not just relaxed but was rearing to get back to action as each muscle in my body felt rejuvenated. Post the treatment I was offered some dry fruits and a selection of teas (green, black currant, jasmine, lemon grass and orange) from a little menu. This really was a spa journey to cherish, easily the best I have had in a while. The 2 hours treatment is for INR 8000++ and the 2 hours 30 minutes version is for INR 9000++. This is a great way to pamper yourself and one that comes highly recommended. Go for it.